Pilot Flying J to Buy Out Partner? KNOXVILLE, Tenn. --Pilot Flying J is borrowing funds to provide a $750 million dividend to shareholders and facilitate a buyout of its private-equity partner CVC Capital Partners, reported The Knoxville News Sentinel. Standard & Poor's said the new credit facilities for Pilot Travel Centers consist of a $1 billion revolver due in 2019, a $1.2 billion term loan also due in 2019 and a $2.25 billion term loan due in 2021. S&P said it expects proceeds from the term loans and $476 million in revolver borrowings would be used to refinance existing debt, make a $750 million dividend payment to shareholders and fund the partial redemption of CVC's stake in Pilot. Pilot Flying J declined to comment. "As a private company, Pilot Flying J does not disclose financial information," spokesperson Anne LeZotte told CSP Daily News. CVC bought a 47.5% interest in Pilot in 2008. CVC later reduced its stake in Pilot to less than 20%. Last year, a Pilot spokesperson said the Haslam family owned 59% of the company, through an entity called Pilot Corp., and that 41% was owned by "other unaffiliated third parties." 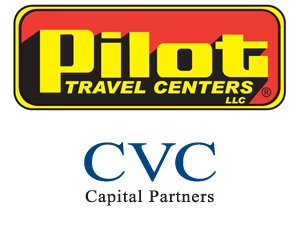 In a separate report issued last month, Moody's Investor Service said CVC owned about 18% of Pilot Travel Centers. A report filed in Kentucky indicated that other owners of the company include Chicago-based BDT Capital Partners; Miguel Loya, Houston; LS Squared LP, Rogers, Ark; Brad Martin, Memphis; and Enterprise Investment Partners LP, Memphis. Chris Stadler, a managing partner with CVC Capital, told the newspaper that CVC is selling half of its remaining stake in Pilot this month and the rest in 2017, as part of a strategy established two years ago. Stadler said Pilot will not be bringing another equity partner into the company. Click here to read the full News Sentinel report. Pilot Flying J, Knoxville, Tenn., has more than 650 retail locations. The Pilot Flying J network provides drivers with access to more than 65,000 parking spaces for trucks, 4,400 showers and more than 4,500 diesel lanes offering diesel exhaust fluid (DEF) at the pump.